Qi Gong and Tai Chi are two closely related types of Chinese meditative exercise. Qi Gong is an ancient practice and a system of health and wellness, while Tai Chi is more recent and is considered a martial art. Both involve movements and postures combined with breathing and mental focus. Both are often considered to be types of moving meditation. For a mesothelioma patient there may be many mental and physical health benefits to practicing either Qi Gong or Tai Chi with an expert guide. They have been proven to increase relaxation, reduce stress and anxiety, improve balance and strength, reduce falls, reduce pain and inflammation, and provide many other benefits that improve the quality of life of cancer patients and others. Qi Gong comes from traditional Chinese medicine and is an ancient type of exercise that integrates the body and the mind. Qi means energy and Gong means skill or accomplishment, something that can be practiced. Qi Gong is a practice and a system of health and wellness that cultivates energy to improve and maintain health. Practitioners of Qi Gong are using an ancient health and wellness system that is today considered a complementary and alternative medical practice. Practicing Qi Gong involves learning postures and movements, breathing exercises, and mental focus. Tai chi is a martial art that was developed in China in the 17th century. Like Qi Gong it is a meditative type of movement that integrates mind and body. It involves moving in slow, controlled, and specific ways, going smoothly from one posture to the next. Because this is a martial art, the postures can be used for self-defense. Most people today, though, use Tai Chi as a meditative type of exercise. It can help improve strength, balance, flexibility, and mental focus. These two spiritual and physical practices from China are very similar, but there are also some key differences. According to the National Qi Gong Association, Tai Chi is a type of Qi Gong. Qi Gong can be practiced spiritually, medically, or martially. The Association describes Tai Chi as a soft and more internal type of Qi Gong (as compared to Kung Fu, another type of Qi Gong) and is considered a martial art. That means that the movements used are combative in nature, although they are done slowly and smoothly. Tai Chi is also newer than Qi Gong; it was developed only in the late 1600s, while Qi Gong has ancient origins. Whether Tai Chi is a type of Qi Gong or not, they are both similar in that they both place an emphasis on postures, which may be stationary or moving, breathing, and mental focus. Both can be described as moving meditation because of the combination of positioning the body in different, specific ways, while also being mindful and focused. Because Tai Chi is a martial art, the movements and postures are usually more complex than those done in Qi Gong. Tai Chi also has a more specific progression from one posture to the next, while Qi Gong is not so strictly defined and the movements and postures can be done in any order. Qi Gong is more adaptive and focused on wellness, rather than martial arts. 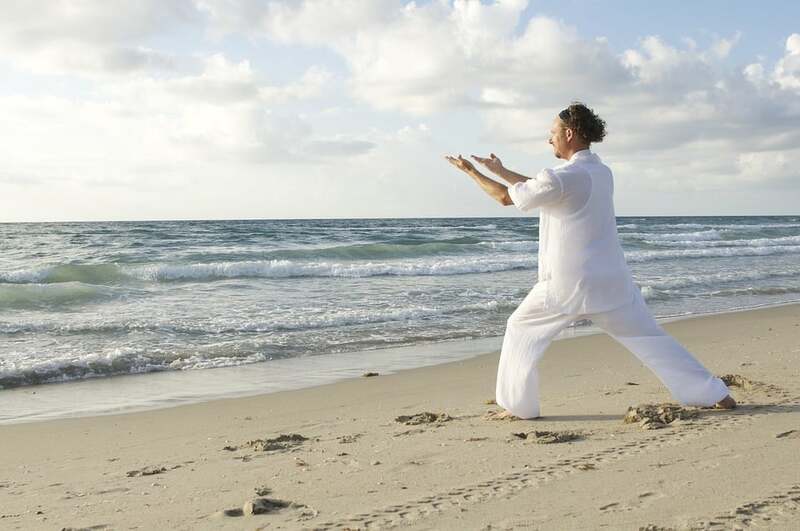 The health benefits of both Qi Gong and Tai Chi are well documented. Qi Gong was developed as a system for health and wellness, but modern researchers have been able to prove several ways in which it benefits good health. Tai Chi is also known to benefit both mental and physical health. Although the movements are slow, the practice is a beneficial type of exercise. Tai Chi, for instance is proven to be a good type of exercise for anyone at any age or skill or fitness level. It can especially help older patients or patients who have physical limitations because of illness, like cancer, regain muscle strength, balance, flexibility, and even aerobic conditioning. Tai Chi and Qi Gong are both known to help reduce pain, including fibromyalgia pain and arthritis. While there are known health benefits of both Qi Gong and Tai Chi for anyone, there have also been studies that investigated and proved that there are specific benefits for cancer patients. One study included a group of cancer patients that were led in medical Qi Gong and a control group that only received traditional medical care. The Qi Gong group saw reduced inflammation in the body—inflammation can cause pain. They also experienced reduced side effects from treatment and an improved overall quality of life. For older patients, Tai Chi has been proven to be effective for improving stability and balance and reducing the number of falls. Many patients with mesothelioma are older and may have lost the ability to maintain stability. Tai Chi can not only help reduce falls, but can help patients feel safer and live with less fear about falling and getting hurt. For mesothelioma patients of any age, stress, anxiety and other negative feelings can greatly diminish quality of life. Studies have shown that practicing Qi Gong or Tai Chi can reduce stress significantly. They may also improve cognitive function. Other studies have shown that, in cancer patients, Tai Chi practice can reduce anxiety, relieve pain, and boost the immune system. Some studies also found that Tai Chi reduced fatigue in patients with breast cancer. Tai Chi and Qi Gong are both generally considered to be safe for most people. There are almost no risks for someone in good health following the guidance of a trained instructor. For a cancer patients there may be a few risks, but these are minimal and for most are outweighed by the potential benefits. Anyone with certain musculoskeletal problems may not be able to practice Tai Chi safely. This may include joint problems, fractures, or back pain, but it depends on the individual. For a cancer patient with physical limitations, Qi Gong may be a better place to start, as it is more focused on wellness and is easy to adapt to individual needs and limitations. If you are living with mesothelioma, get your medical team’s advice before trying one of these types of exercise. Tai Chi and Qi Gong are both types of meditative exercise that are different in some ways but also have much in common. They are both ways of integrating the mind and the body for the purpose of healing, balancing and restoring energy, and for physical and mental wellness. For mesothelioma patients, either of these practices can be great for relieving side effects of treatment, regaining physical fitness, and general improving quality of life.